VesseI: Is the ice slippery at “Best Bar in America”? Rumor had it the high-end cocktail lounge in Seattle’s historic Skinner Building was going to close. 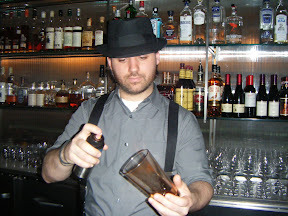 Vessel — famous for its decor, its ice cubes and a disdain for vodka, just named among the “Best Bars in America” by Esquire magazine, home to Seattle Magazine’s “Best Bartender” Jamie Boudreau, imported from Lumiere in Vancouver, B.C. — closing? The next night, I’m out having dinner, when I heard it again — this time from a chef: “Hey, did you hear the rumor Vessel was closing?” I asked. “It’s not a rumor,” he said. Follow-up calls to a Big Name in the cocktail industry suggested that, at the very least, something was up. “The owners have split up, and the one with the money is gone, leaving the other to try to deal with things on a day-to-day basis,” he said. And that’s when I figured: I’d better get over there quick and have a fancy cocktail. Because if Vessel is, in fact, one of the best bars in America, and if, as rumor had it, it wasn’t long for this world, then how can I let it close before I had a chance to see what was so great about it in the first place? Though it’s been open since October, 2006, I’d — gasp! — never been. 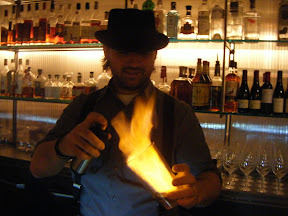 So, on a quiet weeknight last week I stopped in, took a seat at the bar downstairs (it was Deadsville up in the lounge), and had my socks knocked off by a drink involving fire and rosewater. In my rosewater haze, after a lengthy conversation with several women who shared stories at the bar, I left, thinking: Blow me over! Esquire’s right! And praying that those rumors were unfounded. SEATTLE, WA, May 8, 2008 — Vessel’s owner, Clark Niemeyer, is fully enjoying the irony of having his establishment named one of Esquire Magazine’s “Best Bars in America,” while only three weeks ago his business partner in charge of finance, Coleman Johnson, quit unexpectedly, leaving an accounting mess to untangle. And you can read more about Jamie, whose departure sounds like far less of a love-fest than you’ve just read above, right here on his blog. Well? That’s what I know about Vessel. What do you know?